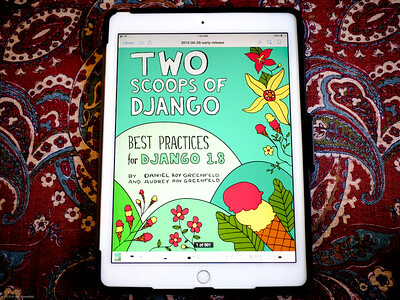 Two Scoops of Django 1.8 is now out in PDF and print paperback formats. You can order the both versions right now. We changed our minds for many reasons. The main reason was to support Django 1.8, a long-term support release, by popular request from readers. What about Django 1.9, 2.0, etc.? Django 1.8 is a long-term support (LTS) release, making this book current for approximately 2.5 years. We won't consider another edition until the next Django LTS (1.11) version is due, which is in late 2017. How big is Two Scoops of Django 1.8? The 1.8 edition added over 85 pages of new/revised material compared to the previous edition. We're at 531 pages, and that's with us streamlining as much as we could. As you can see, on quantity alone, our book is a bargain. That said, we do not equate page count with quality. Our book stands up page-for-page with anything else out there. We've worked tirelessly to write the best book we could. Some people have complained that compared to Amazon's shipping charges and speed, we don't do so well. In many nations, Amazon charges about $2.99 (or free) and the book arrives in 2-3 days. On the other hand, we charge $30 for shipping outside the US (Canada $20) and it can take up to ten days to arrive. You may notice that our total costs per internationally shipped book is $35.16, which is over $5 more than what we are charging most non-domestic customers. We're trying to reduce our shipping costs, and if we can get them below $30 we'll share those savings with new purchasers. Yes! Save $24.95 by purchasing them together. For those who purchase the 'Early Release' PDF, you'll be given an equivalent discount on the print paperback. I Bought Just the PDF, Can I Get a Discount on the Paperback? If you bought the PDF from us, we're happy to extend an US$24.95 discount to you for the paperback. Please email us and include your name and order number. This is the same deal you get with the ebook/print bundle. I Bought Just the Paperback from you, Can I Get a Discount on the PDF? If you bought the paperback direct from us, we're happy to extend an US$24.95 discount to you for the paperback. Please email us and include your name and order number. This is the same deal you get with the ebook/print bundle. I Bought the Paperback from Amazon, Can I Get a Discount on the PDF? If you bought the book from Amazon, we can provide you a US$10 discount for the PDF. Please email us and attach the PDF invoice Amazon sent you. Misprint copies receive a $10 discount. You can order just the paperback or the paperback/PDF combination. The text is aligned so that it is closer to the top than the bottom. Some of the misprints have very light scuffing on their corners. I bought an earlier version, do I get a discount? Apologies, but Two Scoops of Django helps funds all our open source work and Django Packages maintenance fees. By purchasing our book, you are helping us make the world of Python and Django a better place. But I just bought the 1.6 book! That's not cool! What are you gonna do about that? If you bought the 1.6 edition from Amazon.com after March 28, 2015, email us a PDF copy of your Amazon.com receipt and we'll send you a discount code. This offer expires on May 28th. How different is the 1.8 edition from the 1.6 edition? This is a significant update. We've added some chapters (Asynchronous Task Queues and Debugging), broken up a few of them, and did a lot of rewriting. On the other hand, there are places nearly untouched. Please see our change list. We get overwhelming numbers of emails and have a hard time keeping up, sorry! You will get a faster response if you ask us on Twitter. If related to errors or improvements, please file an issue on GitHub. Can I purchase multiple copies of the ebook? India - Indians can purchase the PDF edition via Pothi. The print edition should be out in early October. Korea - In the works is a Korean language translation. If you are a tech publisher interested in translating Two Scoops of Django 1.8 from English, please contact us.